In 2016, the organizers of the All Nations Cup Festival, which includes the German National Championship, had a great idea. In Reinhard Sax, himself a dedicated breeder of Arabian horses, they have found a generous sponsor for the German Nationals, who took all the costs for entry fees and boxes. Around 70 horses participated, 25 percent more than the year before. In 2017, Al Muawd Stud, Saudi-Arabia, sponsored all entry fees. 41 horses were inscribed and the audience wondered where have all the German horses gone. Founded in 1949 the German Arab Horse Society grew into one of the largest Arab Horse Societies worldwide. Yes, the situation for Arabian horse breeders in Germany seems to be difficult. The number of registered Arabian horses has unfortunately dropped since a few years. However, 24 breeders inscribed horses, including the state stud farm Marbach and other breeders from the south of Germany, accepting a long journey. Inspired Stud achieved the Gold Foal Championship with a charming chestnut Ajman Moniscione son: Inspired Ascot out of Inspired Nadeshda. Inspired Nadeshda is also the dam of Bronze Champion Junior Filly Inspired Nahila, this time by Kahil Al Shaqab. The Silver Foal Champion went to EOS Adorable, a filly by SMA Magic One, bred and owned by EOS Arabians. With BS Karani, by BS Karanji, bred and owned by Sprave Arabians, another filly achieved Bronze Foal Champion. Hannelore Bourdeaux happily accepted the Gold Champion Junior Filly for her fine Fadi Al Shaqab daughter Bourhani Fadissima out of AB Bellissima by Psyrasic. Malala, a Meshan Ibn Kubinec daughter out of Marni, bred and owned by Sax Arabians achieved Silver Champion Junior Filly. Reinhard Sax was able to celebrate a double success in the Junior Colts Championship: Lamandro, by EKS Alihandro out of Lamana by Laman HVP, received unanimous Gold while his stablemate Mahil Al Marenga, by Kahil Al Shaqab, went away with Silver. Bronze was achieved by Muranas Adl, a refined son of Muranas Jassehr, bred and owned by Murana Arabians. 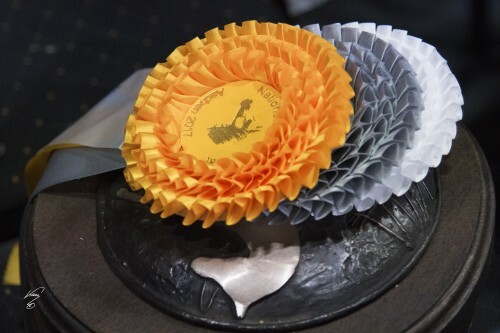 Just three senior stallions participated with the championship placings a repeat of the class: Gold for BB Jawhar El Than, bred in the Netherlands and owned by Karin Zeevenhoven. He is a dapple grey Enzo son out of a Padrons Psyche daughter. The Al Lahab son F Tayyar Ibn Lahab achieved Silver, bred and owned by Araberzucht im Lunzenhof, and the Emiliusz son El Ninjo garnered Bronze, bred in Belgium and owned by FA Arabians. The senior mare classes were exciting. The class for mares of eight years and older saw a tie between Alia Lahab RSA and Sorella El Hadiyah, with Alia Lahab RSA as the winner because of better marks in movement. 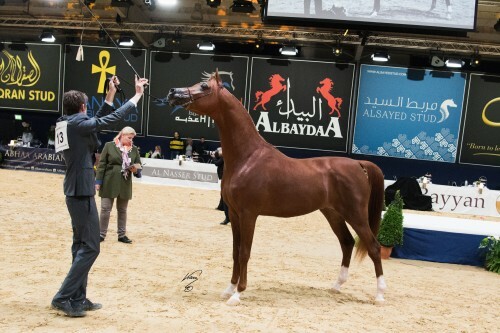 Nevertheless, the Al Hadiyah AA daughter Sorella El Hadiyah garnered Gold Champion Senior Mares with Alia Lahab RSA, by Al Lahab and out of Alia Valentino, winning Silver. Sorella is out of Scala El Jamaal, by Ali Jamaal, bred in Austria and owned by EOS Arabians. Alia Lahab RSA is bred in the USA and owned by Ralf Heckenbücker. Bronze went to Belgian bred Angel Afrikhan Queen, by F Afrikhan Shah, owned by Amurath Stud. Heartfelt thanks go to the breeders, owners, trainers, handlers, and fans of Arabian horses and to all the generous sponsor Al Muawd Stud who made this German National Championship possible. We wish to thank the All Nations Cup organizers and the photographer Jan Kan for partnering with Arabian Horse Results.